The following piece is translation of a new interview with Meysa Ebdo, a YPG/YPJ commander in Kobanê, in which she speaks about the course of the battle and its larger significance for the relations between Kurds and Turkey. It was conducted by Sedat Sur for ANF and carried by Özgür Gündem. -The attacks of the ISIS gangs on Kobanê are entering their 24th day and fighting is now taking place in the city itself. Can you share a little about the current conditions inside Kobanê? The attacks against us have been going on for around a year and a half. ISIS is now using all means at its disposal to attack us. Our people, together with the YPG/YPJ, have faced these attacks with a great spirit of resistance. We have lost martyrs in every village and on every hill. However our goal is protect our people and our land. The latest attacks began along five fronts at once. ISIS has gathered forces from around both Iraq and Syria and is attacking us savagely using its heaviest ground weapons against us. Our resistance has entered its 24th day and their goal and dream is to make Kobanê surrender. However we as the YPG/YPJ and the Kurdish people have shown ourselves as a great example of resistance. The gangs have also suffered many blows and setbacks in Şengal (Sinjar), Maxmur and in the Cizirê Canton. This time they have once again directed their attacks against Kobanê which has been under embargo for a year and a half. They had dreams of entering into Kobanê for Eid. They said they would perform their Eid prayers in Kobanê however the sacrificial spirit and resistance of YPG fighters and the honorable stance exhibited by our people spoiled the dreams of ISIS. In order to enter Kobanê the ISIS gangs will have to pass over our corpses. They will not enter any part of the city without passing over our corpses. We said that would not abandon any position before dying and in the places where they have entered the city the YPG fighters resisted heroically and never surrendered and went on until they were martyred. There has been no place from which we have retreated or just left a position and there will not be. Our martyred friends have have made us determined that ISIS will not enter the city unless it is over our corpses. Only if we die will ISIS be able to enter. Outside of this there is no way. There is not a neighborhood or street that they have passed through where our comrades were not martyred. Let us people know this well: our fighters who are resisting with a spirit of sacrificial resistance have never surrender and have never left their positions without martyrs. The first places they entered the city was to the south and east on 48th avenue and it was hell for them. Our friends died heroically however in the places that they first entered the city they suffered more casualties than could be counted. We can say that hundreds of ISIS fighters have been killed since they entered the city. ISIS fighters by relying on heavy weapons. They are fighting with tanks, artillery and rockets but they have taken many blows. They have suffered many losses and have experienced a serious setback. Up until now we have faced the ISIS gangs with ambushes and traps, creative defence tactics and a sacrificial determination and we turned the first places they entered – the southern tip of the city and the 48th avenue – into a hell. And from now on Kobanê will continue to be hell for them. Many ISIS tanks, heavy weapons and dushkas have been destroyed. Vehicles have been destroyed. In this sense can I say that they have been struck many heavy blows. -Before entering the city ISIS launched heavy attacks against Miştenur Hill for two days and the YPG/YPJ fighters exhibited great resistance on this hill. Can you talk a little about the resistance that took place on this hill? Before they entered Kobanê great resistance was exhibited on Miştenur Hill. In fact we can easily call this the legend of Miştenur. Miştenur Hill was attacked with very heavy weapons from both the south and the east from the village of Helıncê. Before they made it to Miştenur their attacks were broken time and time again. The gangs which advanced from the Helıncê front lost scores of men and they then surrounded Miştenur on all sides. Now ISIS is increasing its attacks on Miştenur from the east and south. Much can be said about Miştenur. When ISIS was on the verge of taking Miştenur our comrade Arîn Mîrkan infiltrated the gangs to the east and carried out a suicide attack in which many gang members were killed. We know that ISIS lost tens of fighters in this attack. Our comrade Arîn and our other comrades who resisted to the death in their positions exhibited a legendary resistance on Miştenur. We said from the beginning that ‘they will only pass over our dead bodies.’ And with the resistance on Miştenur hill we showed this. Thanks to comrade Arîn Mîrkan we can see our comrades who resisted heroically on Miştenur and joined the train of martyrs. Arîn has become a reflection of all our comrades resisting in a spirit of sacrifice. She became the name of the resistance. -Starting yesterday the Kurdish people in North Kurdistan and in the metropolises of Turkey and Europe have turned everywhere into a verifiable Kobanê. What can you say about these serhildans (uprisings)? We have been learning about the serhildans which are breaking out in Kurdistan and particularly in Mardin and Amed (Diyarbakir) since yesterday. I want to say this. There has been many examples of heroism in this resistance. This is not only the defense of a region, this is the defense of a country and a people. Kobanê is a castle of resistance for the Kurdish people and the castle of its existence. It a castle where they politics of denial and extermination have been broken and a system for a free life has been founded. The Kobanê resistance is for the Kurds the name of free life. For this reason this resistance is a resistance of the four parts [of Kurdistan] and the resistance and serhildans that are breaking out in every part are turning them into Kobanê. Our people living in North Kurdistan and Europe are turning everywhere into Kobanê. These serhildans are giving us great strength and moral. It is breaking the support that the hegemonic [powers] have given ISIS. The alliance of international hegemonic powers in Kobanê has not only been made to take one region. It has been made to break the free will of the Kurdish people. These conspiratorial powers want to take their politics of denial which they have been continuing for years and implement them in Kobanê. In this sense Kobanê means the four parts of Kurdistan. The serhildans in the four parts of Kurdistan and North Kurdistan in particular, as well the serhildans of our people living in Europe must continue. If Kobanê falls all of Kurdistan and all the cities of Europe will turn into Kobanê. We know and trust our people around this subject. -Fighters from other peoples have come and joined the resistance in Kobanê. How do you evaluate this? The other oppressed people of the region should know this well: Kobanê is not only a symbol of the liberation and freedom of Kurdistan, but a symbol of the freedom of all the peoples of the region. All peoples have taken their place in this resistance. We have lost 10 of our Arab friends in this resistance. One of our Turkish comrades from the MLKP was martyred in the resistance on Miştenur. All peoples have taken a place in this resistance and are examples of an historical resistance. All the peoples of the region are uniting around Kobanê against ISIS and the policies of destruction of the dirty powers who they represent. The Kobanê resistance is the resistance of the people, it is not only the resistance of the Kurdish people. -In a speech yesterday Turkish President Tayyip Erdoğan said “Kobanê has fallen, it will fall.” What can you say about this? The ISIS attacks have developed as concept and this concept has become clearer in recent days. The Turkish state has a very ambiguous approach to this and are saying that they do not provide support however all developments are signaling that the Turkish state has a part in this concept. The Turkish state must immediately abandon these policies or there will be a major disaster. And it will be the Turkish state which loses. 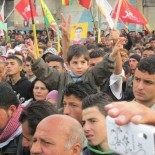 The Kobanê resistance is a resistance to create a democratic Turkey. At the same time is a resistance for democratization in Iraq, Iran Syria and the Middle East. In this sense Erdoğan should that if Kobanê falls Turkey will also fall and it will be a disaster. It will be a disaster for Turkey. Erdoğan is saying ‘it has fallen, it will fall.’ Erdoğan is dreaming and could only dream about the fall of Kobanê. Kobanê is not falling and will not fall. I want to ask this: Have Turkish state officials taken into account how millions of sacrificing Kurds will each hold the Turkish state accountable for this? At the same time the Turkish people need to rise up against this policy as did our MLKP comrade who was martyred. -Do you consider the airstrikes against ISIS in Kobanê by the coalition forces to be enough? We can say that the coalition forces were late in deciding to strike ISIS. They took these decisions very late. They were not very active strikes with results. However over the last two days we can say that the airstrikes by coalitions forces have affected the gang’s attacks. The fighting is now inside the city and thus coordination with us needs to increase. If the coalition forces really want to finish ISIS and are sincere on this subject almost all of ISIS forces in Iraq and Syria are around Kobanê. Then they should continuously and more effectively attack ISIS gangs around Kobanê and in places close to Kobanê in complete coordination with us. If ISIS is broken in Kobanê they will be finished everywhere. We can say that the strikes over the past two days have been positive. The coalition also needs to give us support with weapons and ammunition. Because we have been surrounded on all sides and we have no heavy weapons. We have not allowed ISIS to pass until now using our kalashnikovs. Let no one get the wrong idea, even under existing circumstances we will fight with ISIS for years but the coalition needs to support us with weapons. -What would you like to say in conclusion? I would like to touch upon the resistance of women that is taking place in Kobanê. A great resistance is taking place in Kobanê. 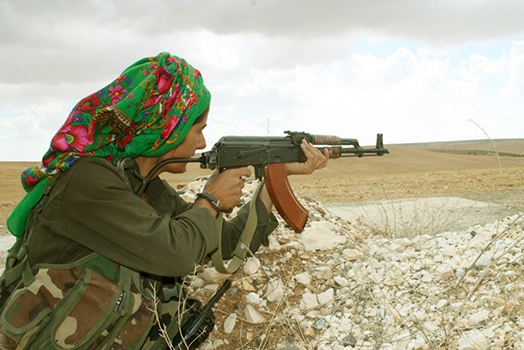 We can say that the Kobanê resistance is in particular a women’s resistance. We can see most recently in the person of Arin Mirkan the sacrificial leadership that women have shown in the Kobanê resistance. This resistance also shows us to what extent there has emerged a free Kurdish woman. The resistance will grow because of Arin Mirkan and the leadership of women and these sacrificial attacks will continue. I want to say this to the people of Kurdistan and to all of humanity. This resistance is a resistance of all peoples and deep down the resistance of humanity against the dirty, inhumane gang of ISIS. Kobanê is the resistance of humanity. We want all of humanity to support this resistance. We are honoring the memory of our martyrs who have been killed in the serhildans in the North, and we offer our condolences to their families and their people. Solidarity with Kobane! Solidarity with Rojava! Congratulations to the brave women of Kobane who so long against stand the “heroes” of IS! This entry was posted on October 9, 2014 by --- in Uncategorized and tagged Arin Mirkan, ISIS, Islamic State, Kobanê, Kurdistan, Sedat Sur, Syria, Turkey, YPG, YPJ.